Masque Milano is a new Italian niche brand with three fragrances that debuted last year — Terralba, Montecristo and Luci Ed Ombre — and a fourth scent, Tango, due to launch in March. Terralba (Act I Scene 1) ~ "You are in such a transition area in which the smells of shrubs and the heath mingle intimately (and indistinguishably) with the saline odour of the sea. You walk cautiously on the rocks of the small pathway leading to the beach, following – almost chasing – the sound of the waves, finding your way through the thick vegetation. It is a narrow and steep pathway. You touch the branches of the bushes. A bent branch bleeds a dense and sticky resinous liquid, whose strong and bitter odour doesn’t want to leave your skin. And – in front of you – deep blue. The horizon expands and you abandon yourself to the sounds and the view of the mighty ocean sea." Developed by perfumer Delphine Thierry, with notes of clary sage, lemon, green tangerine, myrtle, thyme, curry leaves, everlasting flower, lentisc, juniper, cypress and cedar. Montecristo (Act I Scene 2) ~ "Every single element of the interior contributes to the warmth and reassuring comfort. The floor of old robust wood planks, aged and worn with the use. In the massive fireplace, coals are still burning. The comfortable couch is made of the best leather, once stout and rigid, and spotlessly tanned, is now soft and worn, and the colour is fading away. A deck of used playing cards abandoned on the coffee table. The tobacco leaves of the hand rolled cigar. A glass of rum." Also by Delphine Thierry, with notes of cabreuva, ambrette, rum, tobacco, celery seeds, cistus, benzoin, golden stone, styrax, gaiac wood, cedar and patchouli. Luci Ed Ombre (Act II Scent 1) ~ "You are peaceful and untroubled. You feel like you were between a barley field and a thick wood, where no sunbeam can penetrate. There is a blinding light, everything seems calm and quiet. Out of a sudden a shiver runs down your back. You realize that such an enticing scene has a gloomy facet, intriguing and mysterious. It is the night meeting the day, the embrace between light and shadow. The breeze in your hair and the warm and humid breathe of the wolf down your neck. You don’t know any longer neither where you are, nor where you long to be. The dark side is irresistibly fascinating, stronger than any fears and uneasiness it produces. A fresh, energetic, inebriating perfume. And a dark, animalic incense." Developed by perfumer Meo Fusciuni, with notes of ginger, tuberose, jasmine, moss, incense, cedar and patchouli. Tango ( Act III Scene 4) ~ "Whispers all around you, the party is merry. The soft music in the background gets gradually louder. A crescendo. A glass, another glass. Ron y miel. Inebriating, amber nectar. Inebriating as the smell of the blooming jasmine, carried along by the warm summer gusts. A crescendo. You meet her gaze – she whispers a couple of words. You spot it – it is Lunfardo. Your forehead drenched with sweat. Salt melts in the sugar of the liquor. The shuffling Gotan rhythm makes you brave, the night and the tango are on your side. A crescendo. Deafening summons. The air gets even hotter. You are aware it will hurt you. Yet you can’t resist. You stand up and head towards the dance floor… her face lights up with a smile that brightens the night… That is all you long for, now." Developed by perfumer Cécile Zarokian, with notes of bergamot, black pepper, cardamom, jasmine, rose, cumin, patchouli, vanilla, tonka bean, melilot (sweet clover), amber accord, leather accord, benzoin and musk. 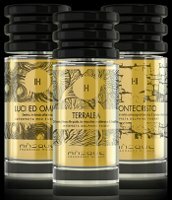 Masque Milano Terralba, Montecristo and Luci Ed Ombre can be found now at Luckyscent in the US, $215 each for 100 ml Eau de Parfum. Probably all translated from Italian by a machine? It certainly reads that way. Perhaps someone at Lucky Scent can translate the above into comprehensible English. The Scents themselves have been reviewed positively elsewhere. I like “thick wood where no sunbeam can penetrate” and then “There is blinding light”. Like what, God in an old Hollywood movie? Only if he sounds like Eddie Izzard doing his James Mason as God routine. Well this sounded interesting until I visited their website…confusing and pretentious would be generous….how astonishingly absurd and naive is the marketing and editorial promotion of the product .Let me complete this olfactory cinematic folly….Act 4…curtain please. With the night AND the tango on your side, how can you lose? I think that’s right, you can’t.